Cane Mill Road delights audiences at Ocrafolk Festival. 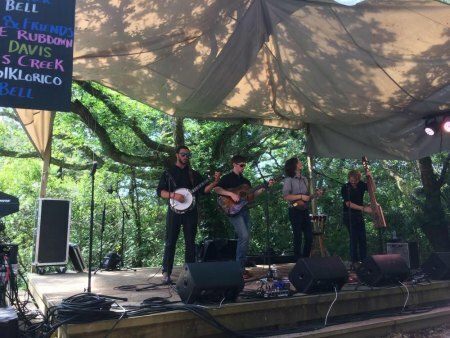 New to Ocrafolk this year was Cane Mill Road, a bluegrass band from Deep Gap, North Carolina, and what a talented group of young men they are! 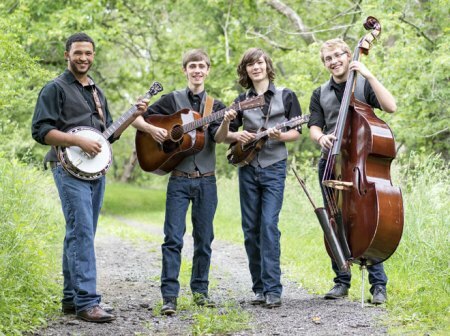 Ranging in age from fifteen to twenty, Liam Purcell, Eliot Smith, Tray Wellington, and Casey Lewis are incredible musicians; they are eclectic multi-instrumentalists and play vibrant and energetic bluegrass. It’s hard to believe this group has only been playing together for four years; they have the maturity, stage presence, and seamless chemistry of a group that has been together for twenty. Cane Mill Road kicked off the Saturday festivities last weekend on the Live Oak Stage, and throughout the day they played a mix of original tunes and covers; they played several original songs on their upcoming album, including the title track “Gap to Gap.” Doc Watson’s “Walk On Boy” and a bluegrass version of “Eleanor Rigby” were also memorable covers. Citing Doc Watson as a major influence for the band, the group’s personal influences include Dave Grohl, Ethan Jodziewicz, Earl Scruggs, and Sam Bush. Cane Mill Road’s own music is fresh and invigorating. “We’re a lot less traditional than we used to be,” Eliot says, and while they enjoy performing covers, they want to focus primarily on their own material. Cane Mill Road charmed audiences onstage with both their talents as musicians and their friendly chat, and I kept overhearing festival-goers saying throughout the day: “Those boys are just so young to be so good!” Kind and personable, Liam, Eliot, Tray, and Casey always had a story to tell, whether it was recalling the first song the four of them played together—“1952 Vincent Black Lightning”—or laughing about something amusing that happened while exploring one of the many places they have traveled to. They even treat mistakes onstage with the same easy confidence they exude during their performances: “laugh about it, then make the same mistake next time,” Casey said. Ocracoke was definitely delighted by Cane Mill Road during their visit, and we really hope they’ll be back!